If you’re looking for a laid-back destination—but don’t want to be far from First World sophistication—few places fit the bill better than coastal Spain. This country offers you all the amenities and sophistication you could want. And as for being laidback…well, the Spanish practically invented the art of hanging out. For pretty much guaranteed sunny weather, one of my favorite regions is Spain’s Mediterranean coast between the cities of Valencia and Alicante. Called the Costa Blanca, or White Coast, this stretch is dotted with little coastal villages and anchored by two substantial cities. Choose small-town life or an urban setting…either way, the beach is close by. And these days, the cost of living and of real estate in Spain is lower than it’s been in years, made even more affordable by today’s strong dollar. A couple can live well in many destinations for as little as about $2,200 a month—even less if they own their home. And properties are available at all price points throughout this part of Spain. The two cities, Valencia and Alicante, offer very different lifestyle choices. Valencia, for instance, is Spain’s third-largest city. It has all the goodies you’d expect from a major urban center: museums, concerts halls, a lively bar and restaurant scene, excellent public transport (metro and buses), and an international airport. It also has extensive parks and other green spaces, and one of the largest historic centers in Europe. All this is served up in a reasonably small package: central Valencia has a population of only about 800,000, while the Valencia urban area is about 1.6 million. For a smaller city with a cozy ambience, look to Alicante. At about 350,000 people, it’s plenty large enough with nice shops, supermarkets, and a superb traditional market. But you’re still usually an easy walking distance to its historic center, with its outdoor bars and restaurants, and to the urban beaches. Walk along its boardwalk, or paseo marítimo, to enjoy the seaside view and breeze, stopping for an ice cream, coffee, or a long, cool drink when the mood strikes you. Frequent buses can take you to outlying beaches if you feel like an excursion. Alicante is more obviously a tourist ”beach” destination—its international airport, served by numerous discount carriers as well as major airlines, is actually busier than Valencia’s. But most of these tourists are Europeans, including lots of Spaniards. And plenty of Spaniards live full-time in Alicante, too: Walk 10 minutes inland from the beach, and you’re in a normal Spanish city. The Costa Blanca has long been popular with European expats, especially the British and Northern Europeans. This means you’ll find an expat community already in place…and locals, as well as expats, who understand English. In central Valencia, in upscale neighborhoods an easy walking distance to the historic center, you can find condos starting in the low- to mid-$100,000s. Typical of these is a three-bedroom, one-bathroom corner apartment with 968 square feet of space. On an upper story of a high-rise, these kind of apartments come with balconies giving expansive views of the city and parks, and coming with an asking price of €129,000—only about $140,000 at current exchange rates. Prefer Alicante? You can find apartments within an easy walk of Playa Postiguet, Alicante’s urban beach, and of the historic center, starting at just over $100,000. You’ll find bargains on offer in this area. Sunny, air-conditioned, 968-square-foot condos, with two bedrooms, one bath, southern views, and a 38-square-foot terrace for sitting outside and enjoying Alicante’s mild year-round climate can be picked up for €98,000—about $106,500. Certainly there’s plenty to do and see on the Costa Blanca, in addition to perfecting your skills at hanging out. But don’t forget that, from here, you also have the rest of Europe on your doorstep. 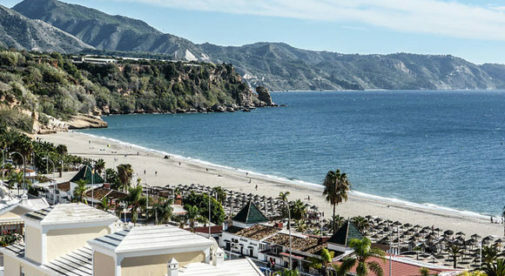 Fly from either Alicante or Valencia to destinations all over the continent… Or take the excellent, high-speed trains to explore the rest of Spain. Whether you prefer small-town life or an urban setting, Spain’s Costa Blanca has everything you need.